Protect your valuable phone with this rugged case! Compatibility: Apple iPhone 8 Plus ONLY (Bigger version of regular iPhone 8). NOT Compatible with iPhone 8 / iPhone X. Full functionality while in case. Protect your valuable phone with this rugged case! Full functionality while in case. Great Gift Item! 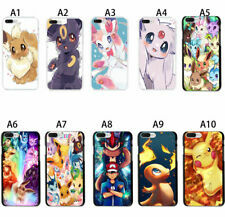 Pokemon iPhone 8 Case. Ultra Slim Design, will not bulk up iPhone. Durable Plastic (back) Soft TPU (sides). Perfect Fit. Full functionality while in case. Protect your valuable phone with this rugged case! - Full access to all buttons, ports and speakers. Pikachu iPhone XR Case. Ultra Slim Design, will not bulk up iPhone. Durable Plastic (back) Soft TPU (sides). Perfect Fit. Oh hey you play Pokemon Go too?! Your ultimate pickup line! This is NOT a Pokemon phone case. This is a Pokemon sticker/vinyl/decal. (e.g. Your transparent phone case). For iPhone 6, 6s, 6 Plus Pokemon Go TPU Cover Case N8. Condition is New. Shipped with USPS First Class Package. Pikachu Phone Case Iphone 6S Brand New Pokemon Anime Case USA SELLER. Condition is New. Shipped with USPS First Class Package. Compatibility:Apple iPhone Xr (6.1"). Protect your valuable phone with this rugged case! Full functionality while in case. Great Gift Item!